Professional associations in the social sciences are increasingly recognizing the importance of properly citing data in their publications to encourage the replication of scientific results, to improve research standards, and to give proper credit to data producers. The Data-PASS partners are committed to promoting standards and improving practices for the citation of data. This site offers guidelines and best practices for citing social science research data in order to promote vigorous and consistent attribution of datasets. The American Sociological Review has already adopted a set of standards for citing data after an appeal from the Data-PASS partners. As other peer-reviewed journals and data stakeholders follow suit, consistently applied data citation standards will ensure that research data can be: discovered; reused; replicated for verification; credited for recognition; and tracked to measure usage and impact. In short, accurate citation of data promotes more and better science, and we believe all data stakeholders can do more to improve data citation. Below are guidelines on how to cite data and what you can do to help. In addition to the above basic elements, we also recommend the addition of fixity information, such as a checksum or Universal Numeric Fingerprint, which enables verification that data used later matches data originally cited. 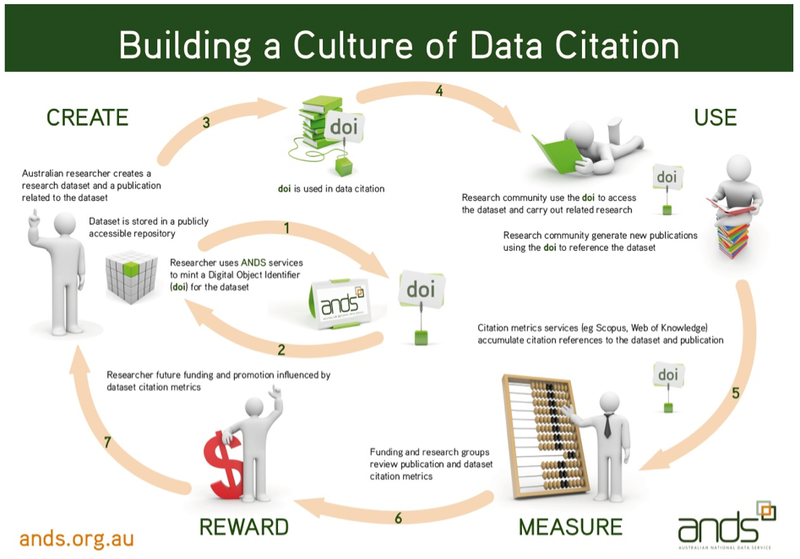 As the below diagram from the Australian National Data Service shows, your actions can make a difference in building a culture of data citation - whether you're a data producer, author, or journal editor. Deposit your data at an archive, such as ICPSR, the Murray Research Archive, the Odum Institute, or the Roper Center. These archives provide free or low-cost permanent preservation, automatically create citations, and display citations so that authors can cut and paste them into their work. Cite the data you use according to the established journal or professional guidelines. Provide data citation standards and examples, and verify that authors adhere to those standards. This will usually mean including data citations with citations for publications in either a list of references or footnotes. Data citations should not be isolated in the text, acknowledgements, substantive footnotes, or notes to tables and figures. The American Sociological Review , for example, provides clear data citation standards in its submission guidelines. Require journals published under your auspices to meet data citation standards. Create and display data citations. Provide persistent identifiers to the data collections. Make the linkages between publications and underlying data explicit. Display data citations with persistent identifiers. Include the option to cite data collections within your software.